If you fall into the category of people, who do not have clear, where each euro of their electricity bill goes, do not worry: according to data from the OCU, only 11% of consumers fully understand their electricity bill in Spain. Furthermore, the majority do not know what type of electric market they belong to – free or regulated – and the full details of their electricity rate contracts… These differences matter to you, since they define the burden of your electricity bill to your monthly budget – and in some cases this can be a considerable chunk of it. In our last week’s blog post we looked into how the electricity price is determined through the electricity pool auctions in Spain and what alternative markets can be used for the purchase of wholesale electricity (see here). In this week’s post we will explain the different options that exist when making a contract for the supply of electricity with a commercial electrical utility. 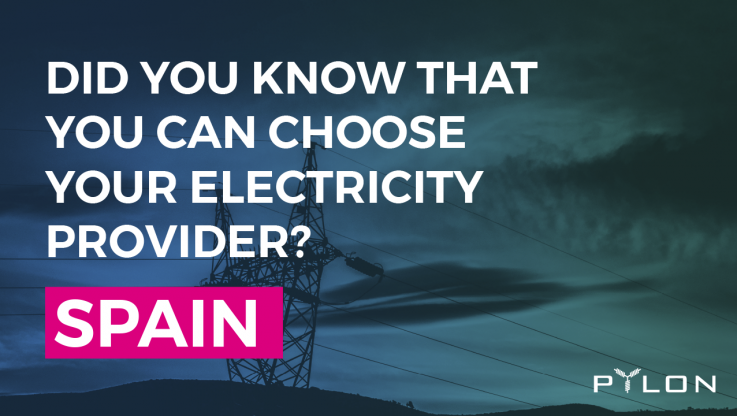 What type of electricity market do you belong to? Probably, you have not wondered out of curiosity and probably you were not aware of the way that electricity markets operate – but on a general basis that there are 2 types of electricity markets: (i) the regulated and (ii) the free (liberalized) markets. In the past, all electricity markets where controlled monopolies owned and run by the State, which also set the prices of energy. This was also the case for Spain until 2009, when a long regulatory reform, which had started back in 1997, passed through and became official. The reform offered for the first time a legal framework for the liberalization of the electricity market. The liberalization offered to consumers the freedom to choose from a range of electricity providers which operate under open competition – currently, almost 500 providers exist; one of them is the energy cooperative GoiEner from the Basque Country, that offers to its members energy is 100% renewable and is participating in the Pylon Network project. Access tolls (fixed costs): fixed by the Government and used to pay for the maintenance of the electricity grid and to send the energy to your house (distribution). The cost of this toll varies depending on the power contracted and the rate you have. Rental of the meter: the meter is usually owned by the distributor and the monthly rental cost varies between 0.5 and 1.15 euros depending on the user. Taxes: the Special Tax on Electricity (5.11%) and VAT (21%). In the regulated market, the reference marketers sell all the energy with the regulated tariff (PVPC) and the Social Bonus; both set by the Government. These marketers can not offer other services, or discounts of any kind. The curious thing about the PVPC rate is that the price is variable; it is set from hour to hour as dictated by the wholesale electricity market (energy pool). The price of energy varies a lot depending on the season, the sources of generation available, etc … So you have to take into account these fluctuations in the price of energy when making hasty decisions and decide to change at a PVPC rate – Voluntary Price for Private Consumers. (To learn more about the energy pool and how the price of energy is established, do not miss our post dedicated to that topic here). In addition, the Government sets a marketing margin for providing this service, which must appear on the invoice broken down both in the term we pay according to the peak power (kW) contracted and in the aggregate energy (kWh) consumed. Another peculiarity is that those who have a digital counter are applied to each hourly consumption the price that corresponds, instead of an average price, which is the practice while not having a digital counter. If the new meter is already available, and you can concentrate your consumption in periods where energy is cheap, you can save. It is a good rate, but it carries the risk that market swings give a scare. All reference marketers must apply the same PVPC price; This aspect they do not like since this rate prevents them from offering other services and offers. The regulation that defines the PVPC is the RD 216/2014 and offers a second option (which is hardly contracted though), according to which, the COR establishes a fixed price all year to avoid surprises, but it is usually comparatively higher than the tariffs that are offered in free market. In the free market the price of energy depends on what is agreed with the marketer. The usual thing is that they are fixed rates, although novel rate offers begin to emerge, taking advantage of the possibilities offered by the new digital meters (hourly rates). Going to the free market looking for stable prices is a good option, as long as it is done with good rates adapted to your needs. If a variable price is preferred, the PVPC of the regulated market is the best option at the moment. To contract in the free market requires you to be informed of key aspects, like the tariff and any applicable promotions, permanence, additional services and clauses of applicable tariffs. See GoiEner rate types, here. Another difference of the free market is that you can choose a marketer that offers you 100% renewable energy, as is the case of GoiEner. If you have made a new high, you have accepted some promotion, you have changed the rate, you have accepted an offer from a commercial that came to your home … then you are probably in the free market. To get rid of doubts, consult the following table for the exact name of your distributor and compare it with the name that appears on your electric bill. On March 16 2018, the CNMC opened a “legally binding” procedure regarding the obligation of vertically integrated energy groups (companies that act in multiple energy markets) “to not create confusion for consumers in the information and presentation of their brand and brand image”. 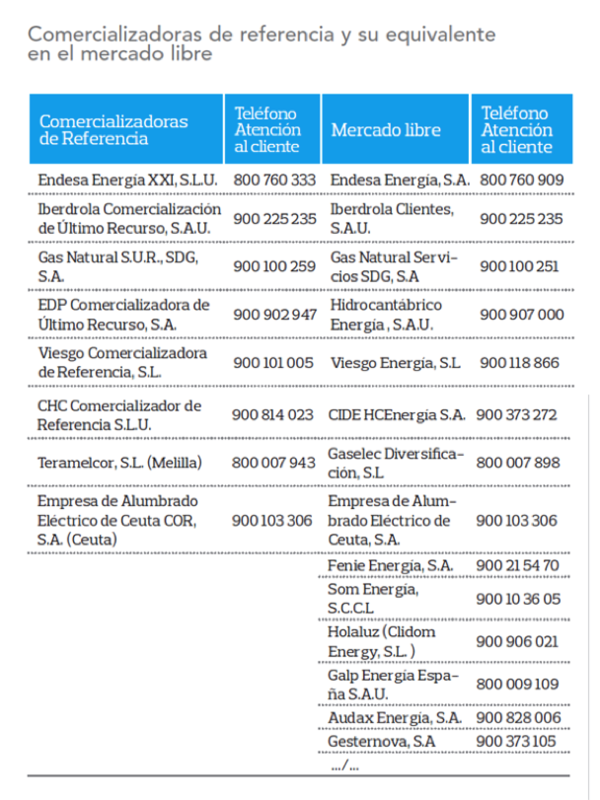 A measure that will radically change the current map of the electricity and gas market if it translates into the obligation for the different subsidiaries of large companies (Endesa, Iberdrola, Gas Natural Fenosa, EDP Spain and Viesgo) to change their current names (brands and image) and not just the last name, as shown in table below (in Spanish). The sale of energy at a regulated price (the PVPC) to households, a business that is carried out through its reference marketers (COR). Commercialization in the free market, at a price freely agreed with any type of consumer. To these activities must be added the generation, also liberalized, which, lacking retail customers, does not cause confusion. In similar studies of the agency, “the bad practices detected in the contracting of electricity and gas, the lack of differentiation of the brands of many marketers” is one of the common outcomes, among others. The big energy companies continue to use similar brands and logos among their companies – which are legally required to be clearly separated. According to the market supervisor this practice offers “an advantage of the marketer linked to the distributor of the area.” and may even be “deriving to an illicit advantage” of vertically integrated groups. The examples of France and Portugal, according to data from the CNMC, indicate that more than 70% of the changes of the regulated market to the free market are destined to another marketer of the same business group. EDP, has been the most successful in achieving a separation of brands (they even call for a single white label for all COR) denounces the difficulties of the marketers to compete in the area of ​​distributors or COR incumbents. The Commissioner of Energy (Miguel Arias Cañete) acknowledges that there are discrepancies within the European Union on how to address energy poverty, but the legislators are moving fast to cover this gap, so that regulated tariffs for gas and light disappear in all Member States, for that prices are defined by “supply and demand”. If you want to be updated on every development around the project, do not forget to subscribe to our newsletter through our website and follow us through our social network pages – see links below.